Everyone is burnt out on both sides of the content equation. As content consumers, we are burnt out. As content creators, we are burnt out. By now, everyone has figured out that there isn’t one blog post that will change your life – either by reading it or by writing it. Content consumers are skeptical of each piece of content that comes their way, & creators feel like there is little to be said that hasn’t been said before. The quality of content suffers when publishers are expected to put out ridiculous amounts of content – either in the form of design, photography, writing, or other creative forms. Photographers start to hate taking pictures when feeling the pressure to post to Instagram three times a day, and writers start to dread having to write yet another blog post, pitch, or even a status update. So why are we doing this to ourselves? The market certainly isn’t demanding it. As a business or a personal brand, it is very important to have quality content out there in the world. It helps establish yourself as an expert, it helps with inbound marketing, & it helps you grow in your field. But the key here is creating quality evergreen content that you can share time & time again. That has been the goal of Push Pull Sales & Marketing – for both the podcast & the blog. We do not put out new content very often, but we make sure that it is valuable, worth saying, & then distribute it repeatedly. Our goal is to put out one new piece of content each week – alternating between a podcast episode & a blog post. All of this only takes a little bit of extra time, but it is so much more enjoyable to write content that you know will continue to be relevant for a while instead of being here today & forgotten tomorrow. It is nice not to bombard our audience with an amount of fluff content that wouldn’t be consumed anyway. It is a relief to be able to work & schedule ahead instead of always feeling behind. It is inspiring to be able to talk about ideas, concepts, & strategies as they naturally come to you instead of always digging for the next idea. I encourage you to re-evaluate your current content strategies & see what is working & what is more stress than it is worth. How much quality content can you realistically put out? How much content does your audience want to consume? 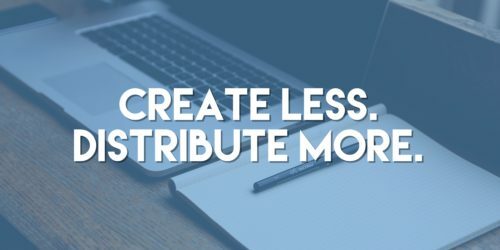 How can you re-purpose your content to get more eyes on it? How can you get results without doing a ton of busy work?